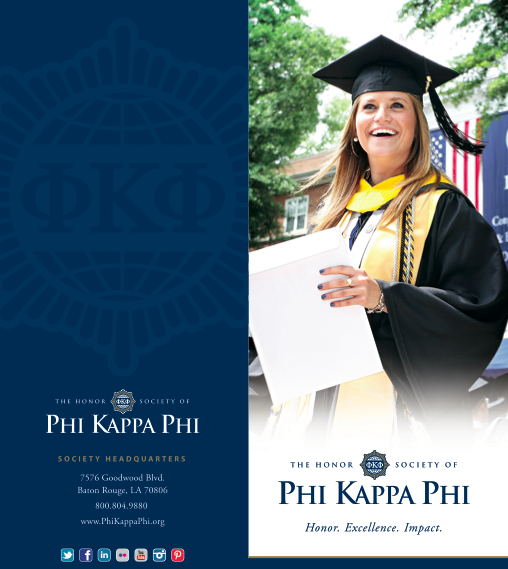 The Honor Society of Phi Kappa Phi's ongoing commitment to excellence is reflected in its award and grant programs. More than $1 million is awarded each biennium to outstanding members and chapters through the Society's various award competitions. Please note that awards are given at both the chapter and national level. Chapter awards are indicated as such in parenthesis on this page. See the Member Accomplishments page to view recent award and grant recipients. The officers and the student membership of PKP award this distinction to the staff or faculty members who best exemplify the creativity, excellence, and dedication in teaching and professionalism at Duquesne University. Two awards are offered. One is chosen by the faculty of Duquesne University. The other is nominated by Duquesne PKP Students. Phi Kappa Phi offers 3 awards to recognize outstanding graduate scholarship across all disciplines in the university at Duquesne University's GSRS. Posters and oral presentations are judged based on intellectual merits and demonstration that the research presented meets the standard of its field. Phi Kappa Phi offers 3 awards to recognize outstanding undergraduate research across all disciplines in the university at Duquesne University's URSS. Posters and oral presentations are judged based on intellectual merits and demonstration that the research presented meets the standard of its field. The Honor Society of Phi Kappa Phi currently awards fifty Fellowships of $8,500 each, six at $20,000 each, and two at $35,000 each to members entering the first year of graduate or professional study. Each active Phi Kappa Phi chapter may select one candidate from among its local applicants to compete for the Society-wide awards. are doctoral candidates and are completing dissertations. The Literacy Grants program was initiated in 2003 to mobilize members and resources of Phi Kappa Phi and the higher education community to champion literacy initiatives. Grants of up to $2,500 are available to chapters and individual members to fund ongoing literacy projects or create new programs. The Phi Kappa Phi Scholar and Artist Awards honor those individuals who demonstrate the ideals of the Society through their lifelong activities, achievements, and scholarship. Recipients are awarded a $1,000 honorarium, one-year active membership, a recognition certificate and the opportunity to attend the Society's biennial convention. The Ray Sylvester Distinguished Service Award grants $1,000 biennially to an active member who has provided sustained, non-compensated volunteer service to others beyond the realm of academia.